Whatever your asbestos problem, we can help. Our free expert advice and competitive quote promise will provide you with the most common sense and cost effective solution. From our centrally based location in Stoke on Trent, Staffordshire; we have helped thousands of customers throughout the UK solve their asbestos removal and management problems with our fast, efficient and professional service since 2003. Over 4,000 people die in the UK every year through past exposure to asbestos. Asbestos has been used in over 3,500 building products and is still present within over 1.4 million properties today. All types of asbestos are potentially dangerous if disturbed. 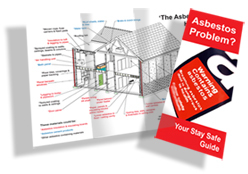 Managing asbestos in non domestic premises is a legal requirement. Always be asbestos aware. If you are likely to disturb asbestos as part of your job, asbestos awareness training is also a legal requirement. If you have any concerns about Asbestos, please get in touch with us and we can help recommend the best course of action. "From start to finish, I would like to thank you all for your fast and efficient service. I was really worried that I had a real asbestos problem but the lady on the phone put my mind at rest. The workmen were very hard working and friendly."